As you might already know, I work remotely. That’s why I try to follow and read guidelines/articles that relate to that style of working. Recently, I got very curious when I saw a new book called “Async Remote” from the Arkency team. Let’s see what it offers. 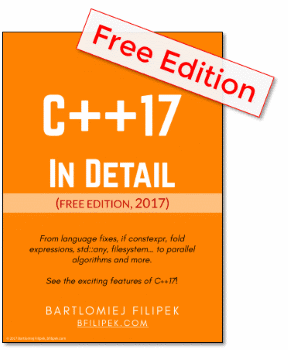 Disclaimer: The idea and all the content here is written on my own, but I asked the authors for a free version of the book (and I received it). Can developers be project managers? Management stuff: mixing roles between devs and managers, working with clients, collecting requirements. How to communicate effectively in the async world, when you work remotely. I enjoyed ‘Async Remote‘! It’s written in a good, fresh style. The authors do have the experience; they know what they are writing about. Although the content is sometimes heavy - like project management, the book talks about it in an easy to grasp method. I only worry that the presented approach is sometimes too idealistic and it’s not easy to apply it in all environments. If you have a small team of people without much of legacy style of management, then there’s some hope of course. Split tasks into smaller ones. I tend to work on larger, sometimes even not well-specified tickets. Now I understand why it’s important to be able to take smaller steps at a time. People like to tick something off as quickly as possible. If you have some long task, you don’t see much progress then your motivation might drop. ‘Start from the middle’ approach - an interesting idea that makes you focus on the most important part and skip the other areas. As always it’s easy to work on the basic stuff and defer the real work. If you start doing the core part, there’s a higher chance you’ll progress quicker. BTW: this can be applied even to blog posts! Think about the core part of the article, the real meat. Over-communication and being proactive - another vital part of working remotely. It’s much better to write a bit more mails/comments than not have a clear spec to follow. Experiment with tools and techniques: async standups/meetings, knowledge sharing, Slack. 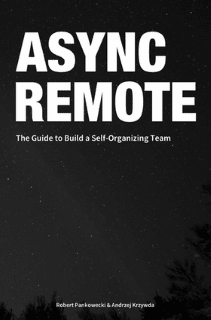 Async Remote is a good book that covers a lot of topics relevant to remote people. Depending on what you prefer: project management, self-management, tools - you’ll find something for yourself. As I mentioned in the intro, it’s not only for remote projects - if you work in a corporate environment you can still benefit from the content. I’d say that everyone that uses some Agile approach will find something for himself. Minor: Feels like a bunch of selected (but polished) essays so not as ‘professional’ as a larger book. Maybe there will be a second version that would go much deeper? What’s your favorite book on the similar topic?